There are millions even billions of ticks in the world. In the United States alone, there are over 800 kinds. They lurk in forest trails, fields, barns and grassy areas. Ticks have an oval squishy body with 8 legs and sensors. These parasites are found in almost every state of the United States. They feed on animal and human blood and live where their hosts live. Let us find out where ticks live inside and outside, where in the US they are most concentrated and the tick population map of 2017. Soft Ticks live in sheltered places like barns whereas hard ticks prefer woods, bushy areas and open spaces as they have a protective shell. They do not hop or fly like fleas. So you will find them on the ground mostly. They crawl from place to place and host to host. When they bite, they can cling to the host and draw blood for several days. When they are full and their bodies are filled with blood meal, they drop off. 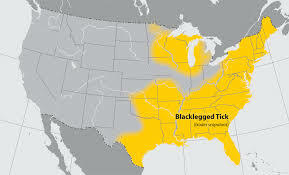 Black legged ticks are mostly seen in bushy areas, and their activity is higher during mid May to mid July. Based on tick population map of 2017, you can tell which areas are the high risk zones. This way, you can avoid being in the high risk regions. Experts recommend keeping off the grass and sticking to well traveled paths and trails in order to avoid ticks. Where else do ticks live outside and indoors? Ticks can also be found in lawns. If you have left clutter under your porch or deck, then you are at a higher risk of getting them. So remove all clutters, old play sets etc. These become harbor grounds for animals like possums which carry ticks on them. Also keep your lawn mowed at all times as shorter grass blades will deter their access to hiding places. You can also fence off your lawn/yard from the forest area by adding some woodchips in between. Pet owners having tick infested pets are likely to find ticks everywhere in their house if they do not take proper precautions. They may be seen hiding in cracks, crevices, bed posts, spring box and pretty much everywhere in the house during the warmer months. The best way to control them indoors is to bathe the pet, use a tick collar or other preventive medicine and also vacuum and clean all rooms regularly. What state has the most ticks? Minnesota-The land of lakes has more than 45000 reported cases of Lyme disease since 2012. 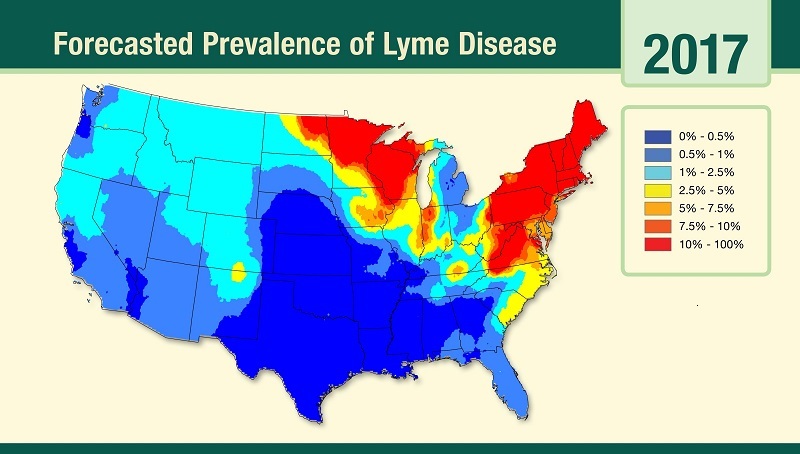 Wisconsin- America’s Dairy Land has over 64,000 reported cases of Lyme disease. New York-Pet owners need to be careful as there are more than 90,000 reported cases of tick borne diseases. Massachusetts- This is the worst state for ticks as per the CDC as there are nearly 130,000 reported cases of tick borne diseases. The American dog tick is also called Dermacentor variabilis. It is widely distributed across the Rocky Mountains and in some areas along the Pacific Coast. They transmit diseases like Tularemia and Rocky Mountain spotted fever. American brown tick can live anywhere their hosts live such as inside our homes, in dog kennels, and everywhere where dogs live. You might also see them in leaf litter and duff on soil. Since the 1980s, deer ticks have been the most disagreeable pests in American outdoors as they are increasingly found to be hosts to Lyme disease pathogens. Deer tick is about the size of a sesame seed, much smaller than the dog tick. They are mainly concentrated across Northeast from Virginia to Maine, Wisconsin and Minnesota, and Northern California. Deer ticks are prevalent in months of May, June and July. Having better understanding of post treatment Lyme disease. We hope these tips along with the tick population map 2017 help you become more aware of ticks in your area. Do use integrated pest management as well as resources on this site to prevent tick bites.